Another year has passed, but the local story remains the same — demand has all but dried up the housing supply, sending rent and home prices into the stratosphere. As we head into 2016, we at Peoples’ Self-Help Housing (PSHH) are seeing the same stories as well — a hard-working mother looking for a safe home, as her family can’t afford what’s on the market; a veteran who bravely served our country but is now living out of a car. We do all we can to find an opening in our affordable housing for those in need, but the waiting list has ballooned to about 3,000 families and individuals. As president and CEO of PSHH, the largest affordable-housing provider in the Tri-Counties, I want to let you know we haven’t taken this challenge lying down. If anything, we’re more determined than ever to provide a safe, affordable home for low-income families, seniors, veterans and other special-needs groups. In its 45-year history, PSHH has developed more than 1,600 affordable-housing rentals that it continues to manage, and has helped nearly 1,200 families build their own homes in the Tri-Counties. We’re proud of what we’ve been able to accomplish — but the battle is far from over. This requires effective leadership from local government to pull every piece of the affordable-housing matrix together, such as supporting Community Development Block Grant and HOME funding. Local nonprofit affordable-housing developers must play their role as well, with their expertise in navigating complex financing, land-use and property and asset management practices. Finding properties suitable for affordable housing is another great obstacle we face. But we’ve been able to take a creative and unique approach to the problem by preserving existing affordable housing, keeping it from being re-introduced as market-rate housing or condos. 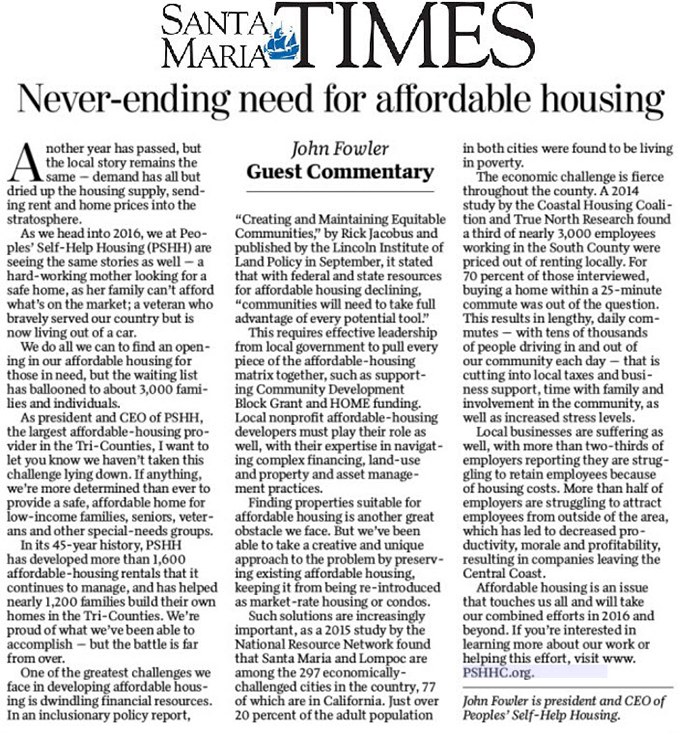 Such solutions are increasingly important, as a 2015 study by the National Resource Network found that Santa Maria and Lompoc are among the 297 economically-challenged cities in the country, 77 of which are in California. Just over 20 percent of the adult population in both cities were found to be living in poverty. The economic challenge is fierce throughout the county. A 2014 study by the Coastal Housing Coalition and True North Research found a third of nearly 3,000 employees working in the South County were priced out of renting locally. For 70 percent of those interviewed, buying a home within a 25-minute commute was out of the question. This results in lengthy, daily commutes — with tens of thousands of people driving in and out of our community each day — that is cutting into local taxes and business support, time with family and involvement in the community, as well as increased stress levels. Local businesses are suffering as well, with more than two-thirds of employers reporting they are struggling to retain employees because of housing costs. More than half of employers are struggling to attract employees from outside of the area, which has led to decreased productivity, morale and profitability, resulting in companies leaving the Central Coast. Affordable housing is an issue that touches us all and will take our combined efforts in 2016 and beyond. If you’re interested in learning more about our work or helping this effort, visitwww.PSHHC.org.